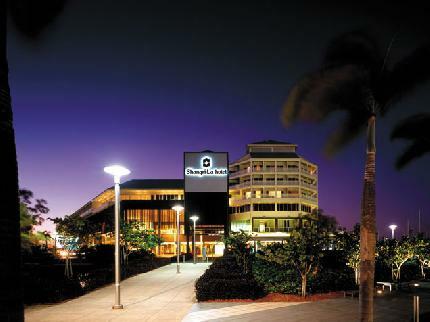 Conferences and Events in Cairns: The continuing story…. 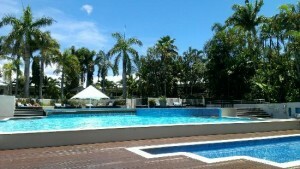 When we featured unique venues in Cairns, I gave you a couple of hints on two very different style 5 star hotels in the Cairns CBD area. One of them, reminiscent of the famous ‘Raffles of Singapore’, the other, clean and modern. This blog is focusing on two of the 5 star hotels in Cairns: the Pullman International and the Shangri-La. Pullman International : I was fortunate enough to stay in this delightful hotel. Situated directly opposite the iconic Reef Hotel Casino and a very short walk to most amenities in Cairns, the 321 room Pullman is reminiscent of the iconic Raffles, Singapore. With wood panelling and white louvres, the entry décor is a perfect foil for the Cairns tropical heat. The foyer areas are pleasant to sit and wait with tour groups, and there is a raised bar area with piano player which could easily be used for small gatherings, and welcome cocktails. The hotel has over 3,000 metres of conference and meeting space, 17 different flexible meeting and conference areas, and the Grand Ballroom is well equipped to handle up to 420 for a gala dinner. If one was to find an issue with this venue, it is the lack of natural light in the meeting rooms, however, with lovely terrace style spaces running outside the smaller rooms on the upper meeting floor, this can be overcome with clever use of the outdoor space during breakouts. 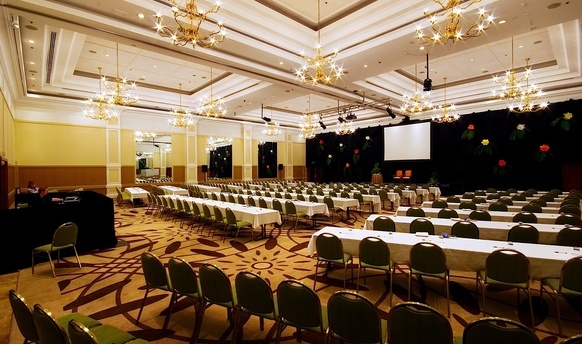 I would encourage you to view the hotel and its facilities and Catalyst Event Solutions can assist you with any enquiries that you may have about holding your Conference or Event here. Shangri-La Hotel : Perfectly positioned on the Marina in Cairns, the recently refurbished Shangri-La hotel is a very modern contrast to the genteel style of the Pullman. Located right above the water, you almost expect to see the native saltwater crocodile poking its head up to smile, as you sip cocktails on the deck! The Shangri-La has 255 guestrooms and suites, with most having private balconies overlooking the city, the hotels gardens, Trinity Bay or the Marina area. Arriving at the hotel, we viewed the conference spaces to find the Shangri-La can host theatre style meetings up to 330, banquets for 220 and cocktails for 400. If larger spaces are required, the close proximity of the Wharf function space is an easily accessible option. We were given a delightful introduction to the catering capacity of the Shangri-La. We joined the events team for a showcase of sushi and champagne in the newly refurbished bar area; tasted the delights of the bruschetta with heritage tomatoes in the pool area; and finished with an amazing dessert buffet in the function area. The Shangri-La and the ‘can-do’ attitude of the staff makes this beautiful, contemporary hotel a must to inspect if you are considering an event in Cairns. In the next blog entry of this series, we will feature some of the amazing team building and leisure activities which can be accessed in this area. You may be interested to know that Louis Vuitton offers a team building activity ….. intrigued? Visit again soon and we will share the skills of the amazing LV team in Cairns! Thinking of Cairns? Contact us now!